We have often talked about Intel Optane : it is a technology on which the Santa Clara company has invested so much and is increasingly being offered in our country too. As explained in the Intel Optane Memory article or how to accelerate the performance of the system those currently available on the market are memory modules that drastically accelerate the performance of systems based on traditional hard drives and SATA SSDs . Although Intel has recently decided to take a step back and let Micron develop the XPoint 3D technology on which Optane is based ( Xpoint 3D technology will pass into Micron’s hands ), the company will continue to develop new products. 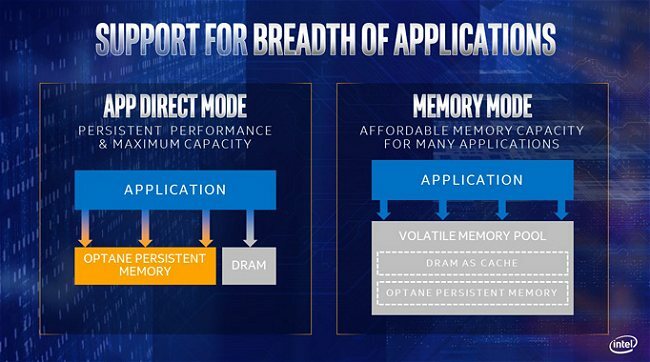 Intel Optane DC Persistent Memory is a bit considered as the evolution of Intel Optane Memory because it also combines skills aimed at the persistent preservation of data : Intel presents Optane DC memories that can be used both as RAM modules and as SSD .Today Intel has announced that it has started the “beta program” focused on Intel Optane DC Persistent Memory : this means that every cloud provider and every partner company (OEM) will be able to use a preview of the new memories that will be officially brought to the market during the first half year 2019 . Thanks to the new Intel Optane DC Persistent Memory, combined with the new Xeon processors of the next generation, companies can revolutionize the ways in which heavy workloads, cloud processing, databases and high performance computing are managed: it becomes possible to bring performance to a much higher level, thanks to the ability to store and move data in memory quickly . Used in the App Dire mode , applications can count on performances never seen before thanks to the possibility of keeping in store, in a persistent way, an important amount of information. The Memory mode mode , however, allows you to use Intel Optane DC as a volatile memory using it as additional memory capacity than that offered by the RAM modules installed at the motherboard level. It will thus be possible to have an additional, extremely fast, large storage capacity up to 512 GB . All this without the need to change a line of software side code. 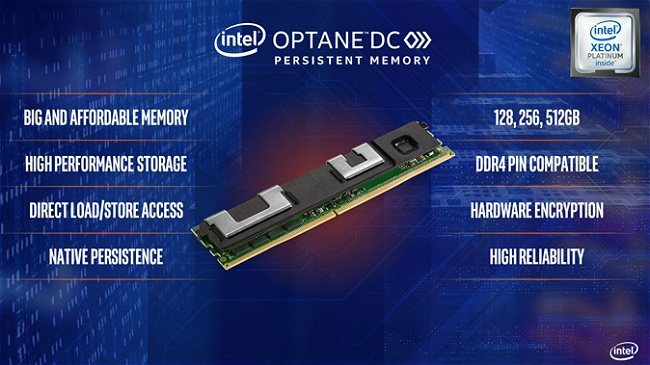 Intel partner companies that have embraced Intel Optane DC Persistent Memory right from the start are Alibaba, Cisco, Dell EMC, Fujitsu, Google Cloud, Hewlett Packard Enterprise, Huawei, Lenovo, Oracle and Tencent. Intel is also working with the most important software developers to optimize their solutions so they can take full advantage of using Intel Optane DC. The companies that have decided to join are, for the moment, Aerospike, Altibase, Apache Spark, AsiaInfo, Cassandra, DataBricks, Gigaspaces, IBM, Microsoft, Red Hat, RedisLabs, RocksDB, SAS, SAP, Sunjesoft, SuSE, Ubuntu, Virtuozzo and VMWare.